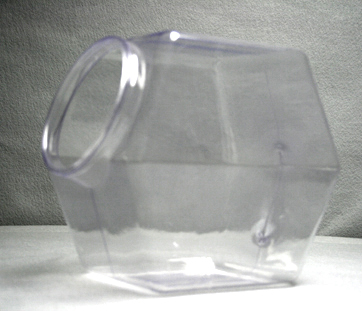 Appeal to your shoppers with cutting edge sales with these plastic hexagon stacking containers. 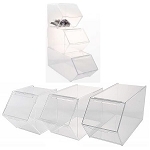 These stackable containers can be used on shelves or counter tops to preserve your much needed space. 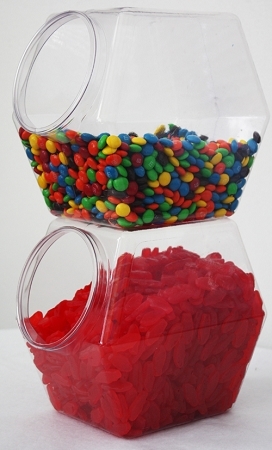 A variety of snacks, such as candy, cookies, yogurt toppings, and cereals can be used to make a display of plastic candy containers. Stacking candy bins will be a welcomed addition to candy and yogurt shops. Plastic jars are a safer alternative to glass containers, which means less breakage and replacement cost. The hexagon shape will let you be creative and different. These plastic bins allow you to decorate your business in the way that suits you. Sell those goodies and proceed to profits. Don't delay, order your container for candy today. I purchased these stacking containers to store small toys in and I love them. Helped me to organize and they look pretty too.